The walk from the parking lot to the tasting room is lined with about a dozen macro bins each with thriving gardens of beats, kale, and other veggies. The spacious tasting room is in a wooden building that looks out of place among the giant hangars. The wineries are located about a hundred feet away in a giant hangar. The staff was very friendly and they even opened a bottle of sparkling wine that wasn't on the list. Which was quite lucky because the sandwich that I had was killing my palate, but the sparkling wine cleared the slate and my taste buds were back in action. Our hostess, Kelley, was very knowledgeable about the various wineries and wine in general. The 2010 Fume Blanc Napa Valley made by JRE Wines ($18) is a translucent greenish color which usually denotes less than ripe grapes, but this has lots of tropical notes from nose through finish and lacks the grassy and vegetative notes one would expect from such a wine. The nose also has grapefruit and the palate has green apple accents. It is nice and crisp with a lingering finish. 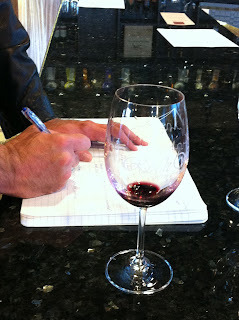 The 2009 "Siren" Pinot Noir Central Coast made by Joseph Gary Cellars ($26) is a semi-opaque cherry red in the glass. On the nose it exhibits raspberry, sour cherry, earth, and slight forest floor notes. On the palate there is earth, spice, and sour cherries. This wine has a good and high level of acid with a spicy finish. For $26, it has a great quality to price ratio; when I went it was on sale for $22 which is an excellent qpr. I don't know how long that sale lasts, but I recommend jumping on it. This wine is ready to drink now and given its acidity, it could develop for a couple years in a cellar. The 2009 Cabernet Franc Alexander Valley made by Ehrenberg Cellars ($24) showed cherry, bell pepper, and spice on the nose. The cherry and bell peppers continued onto my palate where they were joined by earth and the spice developed into cinnamon and nutmeg. The nutmeg continued into the finish where it was joined by some white pepper. The 2009 Merlot Napa Valley made by R&B Cellars ($35) has notes of cinnamon, clove, and chocolate on the nose. The first thing I noticed on my tongue was cherries wrapped in milk chocolate and then the leather, cola, and tobacco notes. This wine is structurally sound with large round tannins and a long lingering finish. The 2008 Syrah from Kick Ranch in Sonoma made by Carica ($36) is dark and inky red in the glass. The wine is fruit forward with aromas of blackberry and black current. The black fruit continues onto the palate where they are joined by vanilla. This wine could use another year or two for the tannins to finish rounding out as they are still a little astringent, but partially rounded. The Merlot and the Pinot were my favorites, but all the wines listed had good to great QPRs. Rock Wall is located at 2301 Monarch Street in Alameda and is open Wednesday through Sunday from 12pm - 6pm . 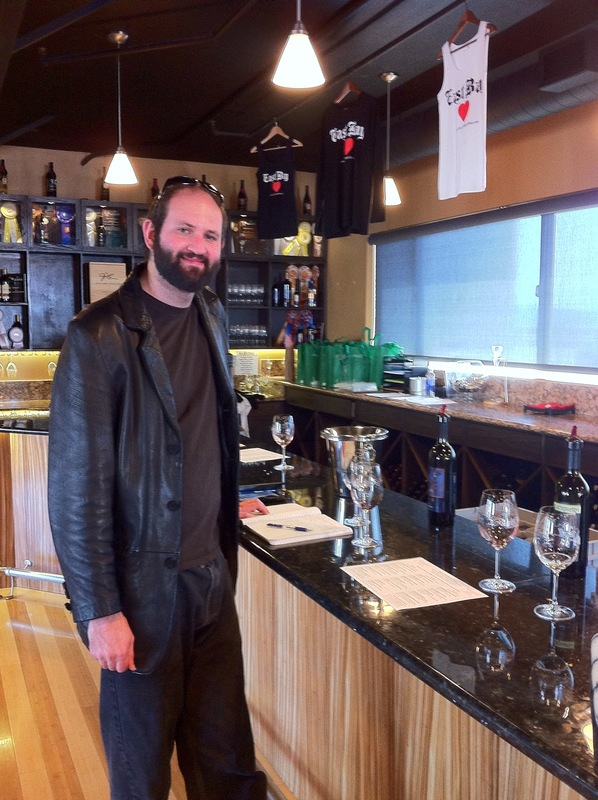 For more information, call 510-522-5700 or visit http://www.rockwallwines.com. I've been to their hanger for a wedding and a video shoot. They've always been really nice. Yeah the people in the tasting room were super nice and the couple of follow up emails from the wine makers were also warm. Thanks for sharing your notes about some of the offerings from all the wineries at Alameda Point. We hope you'll be back! It was my pleasure. 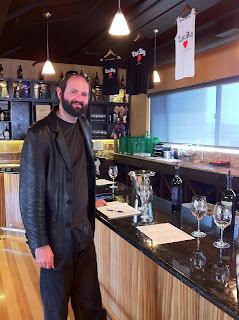 I will certainly be back at some point as there were so many wines I did not have the opportunity to explore.